Inspired by the delicious slow cooked pork belly dish at The Test Kitchen in Cape Town I decided to cook some pork belly myself. But instead of the parsley infused apple that was served with the pork belly at The Test Kitchen, I serve mine with poched guavas. Guavas are a winter fruit and in season at moment, so it makes sense and also roots the dish more firmly in African soil. 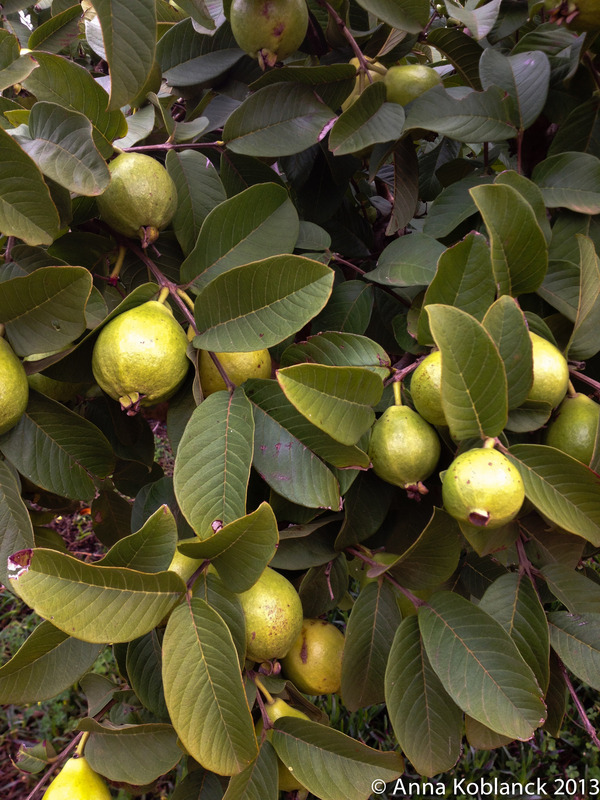 Guavas are not indigenous to Africa, but South American, and you are in fact not even allowed to plant any new guava trees in South Africa as is the case with many exotic trees. It is however a popular African taste today, with guava juice a very common drink for example. I prefer them poached, as the cooking process and the sugar brings out the strong flavour of the fruit in the best way. This roasted pork belly recipe is inspired by a Jamie Oliver recipe, and the blue cheese sauce is inspired by the dish at the Test Kitchen. There was no gorgonzola for sale in my local supermarket, but a local South African variant named Simonzola after the producer Simonsberg. There are a number of good cheese producers in the Cape Winelands, and several of the vineyards produce cheese too, so it’s easy to go local. I was running a little late when making the sauce, so I had no time to try any of the advanced recipes I found on the internet. Instead I simply added the blue cheese to some heated creme fraiche, and I have to say I am really quite pleased with the result. Personally I prefer simple cooking, so this recipe is one for keeps. 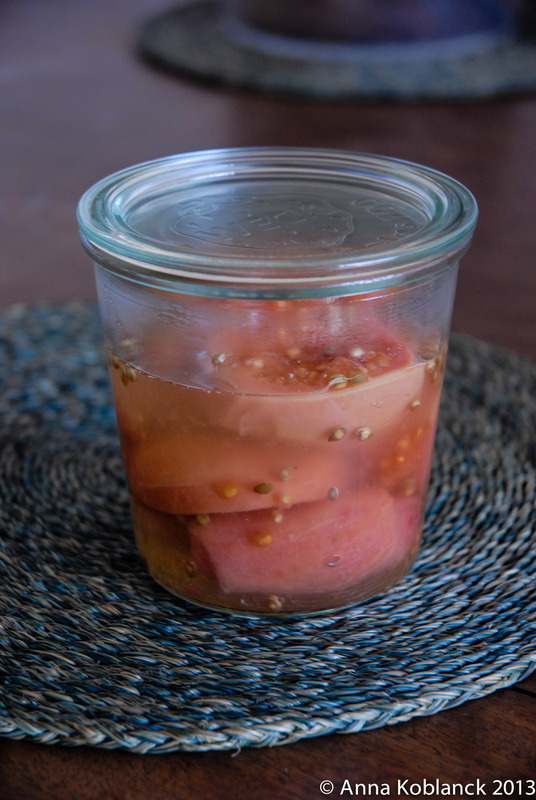 There will be left over guavas, but you can store them in a jar in the fridge for a week to enjoy again. Turn your oven on as hot as possible. Cut the skin of the pork belly in a checkered pattern down to the meat, but be careful not to cut through to the meat. Grind the sea salt and fennel seeds in a mortar until the fennel seeds are smashed and mixed with the salt. Brush the pork belly with the olive oil, and then rub the salt and fennel mixture into the cut skin as well as possible and sprinkle the rest on top. Roast for 5-10 minutes, or until the skin starts going golden and bubbly, and then turn the heat down to 180 C and cook for another 60-70 minutes (generally for 30 minutes per 500 grams, and then another 15 minutes). When done, let it rest for 10 minutes before you cut it. Combine water, sugar, vinegar and coriander seeds in a pot and bring to a boil. Then turn down and let it simmer while you add the guavas. Poach the guavas until they are soft and have taken on a more intense pink colour. Serve hot with the pork belly. Carefully heat the creme fraiche in a pot. When it’s dissolved, stir in the milk and keep at medium heat. Add the gorgonzola cheese in crumbles, and stir until the cheese has dissolved. Voila – as simple as that! 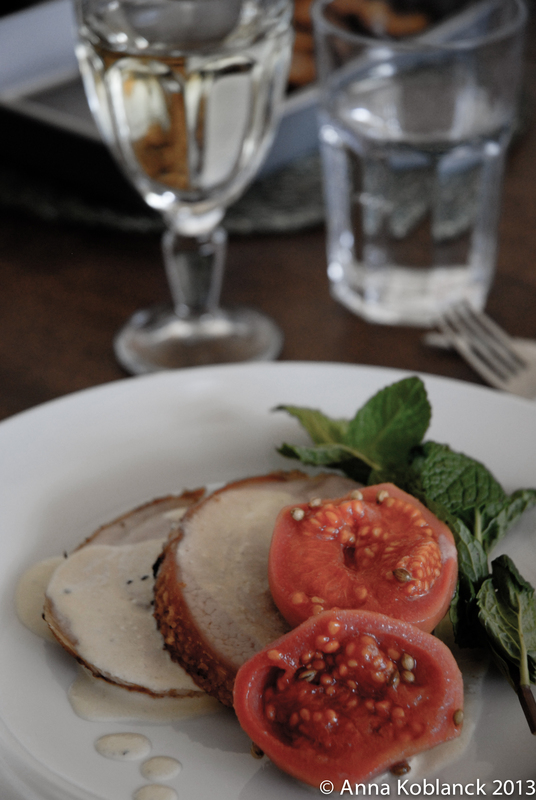 Serve pork belly, guavas and sauce with roast potatoes or perhaps some oven baked fennel, and a crisp white wine. Guava tree at the lovely Babylonstoren garden, near Cape Town. Left over guavas – lovely with yoghurt. So looking forward to trying this with guavas, once they’re back in season – it looks, sounds and I’m sure tastes wonderful!